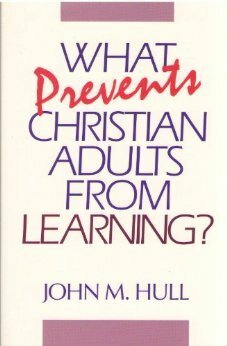 Title : What Prevents Christian Adults From Learning? This is a brilliant work. There aren't many sociologies of the Church done from the inside of faith. Hull's basic thesis is that some people look to find in the Church a "safe haven" from conflict, particularly where their own childhood experience failed to supply that security.Learning violates the simplicity of the haven. So learning itself is something which people come to church to avoid, and do not want to find there.A Church which answers this need emphasizes transmission of received truth rather than creative learning, and justifies it thus: "The religious imagination, because of its ideological character, has a way of conferring the authority of antiquity upon the innovations of yesterday. "Having identified the problem, Hull offers some hopeful, and surprising, solutions. "Working from and within the experience of the learner is not always the best learning tactic. Sometimes, when experience is construed rather tightly, there is too little scope for the introduction of new interpretation." [p110] "Worshippers familiar with white walls should undertake study tours of the statues, wall reliefs, stained glass and monuments of another religious tradition. Congregations where children are found to be a distraction should stop thinking about their ministry to children and start to think about the ministry of children to them....To educate the religious adult is... always to educate the child within that adult." [p151] And by way of a challenging encouragement:"...an adult who really understands a religious problem will always be able to express it." This may not be the most snappily titled work. But very few works show so graceful an understanding drawn from so broad a range of disciplines.Hull gives us the fruit of experience economically expressed, as in this telling insight:"The discovery `It is a symbol' is often experienced as `It is only a symbol'." [p111] How good is that? Read it and learn.